flat assembler - What I am currently working on. flat assembler > Projects and Ideas > What I am currently working on. You forgot the vertical lines to show if there are other folders at the same level further down. The modern Windows abandoned these ugly vertical lines. But I will probably implement them later, some day. BTW, you can help me with the code - it is in the repository. Simply add the lines and send me the patch. Or if you don't want to mess with my code - you can implement the next target - tool bars and I will make the lines instead. The modern Windows abandoned these ugly vertical lines. Pity. They are useful and provide extra information without taking any extra screen space. But alas, Windows removed them from explorer by default and thus reduced the usefulness of the folder views. BTW, you can help me with the code - it is in the repository. Your repository thinks I am a bot and sends me to the honeypot. Oh, no, no! Don't try to escape! The web UI is only an option for easy browsing. In order to work on the code you will need the console fossil and it will not need JS or web browser at all. Use "fossil help" in order to get the help for the fossil syntax. Or read the fine manuals: here. So, the Windows port of FreshLib GUI toolkit is ready and working now. In the attachment you can download the full set of demo programs I used to test the library, compiled for Linux and Windows. Now I only have to make more GUI widgets and the way for Fresh IDE v3.0 will be open. and could be first asm gui toolkit. EditText --> Needs to place cursor at clicked point within string. I wondered when someone will notice. It is simply not finished. The whole code of TEdit is very old and need a lot of fixes. But it works enough for the tests and will be fixed later, when the architecture as a whole is more fixed. Here is the first approximation of TMenu. [+] - Fully implemented (more or less). [?] - Partially implemented/work in progress. [ ] - Not even started. [ ]   TListView, TListbox or other kind of table/grid control with columns. [ ]   Color selection dialog. (not so important). [ ]   Font select dialog. You can see, there is a lot of work remaining. So, until then, download the demos and enjoy the screenshots. 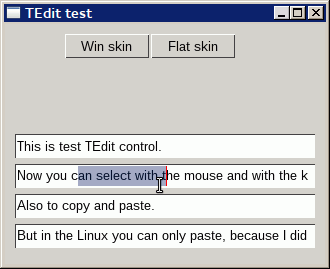 Description: Demo executables for Windows and Linux. because some users might need bigger font to see, or color blind or etc sight issues. This data is aimed to be handled as a separate config files. I simply packed it in the executable in order to not use external files for the demo. BTW, the theme support in FreshLib uses interesting technique that keeps it own label names and can store/restore the fields from a string: gui/themes.asm - see the macro NamedArray. TAction is a non-visual object that contains some common parameters as caption, icon, status and executable code (action execution). It can be assigned to several controls (buttons, checkboxes, menu items, etc.) simultaneously and automatically synchronizes their appearance and behavior. It makes very easy to handle complex user interfaces. 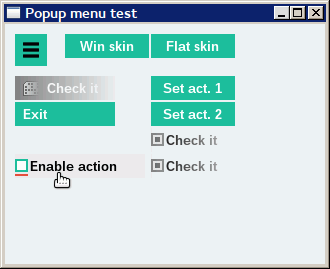 In the below demo, you can see TAction in action together with the new checkbox controls and improved buttons and popup menu. You want to evenly position the menu texts. Also, the font looks too bold but maybe that's a matter of customization. The other skin ("Win skin" button) has tiny font. Test it. I didn't understood about the menu texts. Please, explain more detailed. JohnFound, i just joined, and the pics/themes... those are smart. And here is the next demo, concerning the controls layout engine - so called split grids. It allows automatically placing and aligning controls on the client area of the parent window. 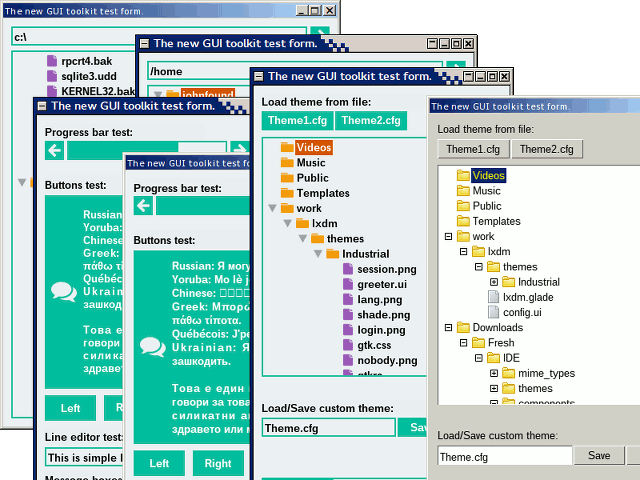 Description: The demo executables, compiled for Windows and Linux. Not so fancy as the previous, but now it behaves almost as intended. Here is a demo about the text edit controls. 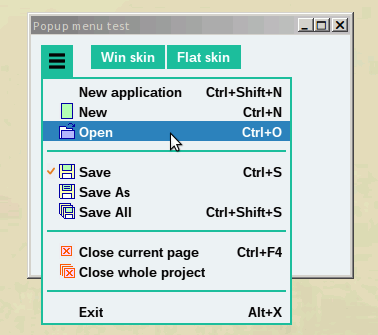 Now with mouse interface for selections. P.S. @sleepsleep - please, edit your post above. This huge quote is not so useful for the subject, but breaks the horizontal layout of the forum (when editing new messages). At least, remove these long base64 encoded rows. Thanks. Description: On the screenshot is the Linux version.